A Russian officer takes a picture of a TU-95 bomber, or Bear, at a military airbase in Engels some 900 km (559 miles) south of Moscow August 7, 2008. Russia’s power projection in the Pacific is in sync with its growing assertiveness globally, but it doesn’t necessarily threaten the U.S. According to NATO, Russian air patrols outside its borders were at their highest level since the dissolution of the Soviet Union in 1991. 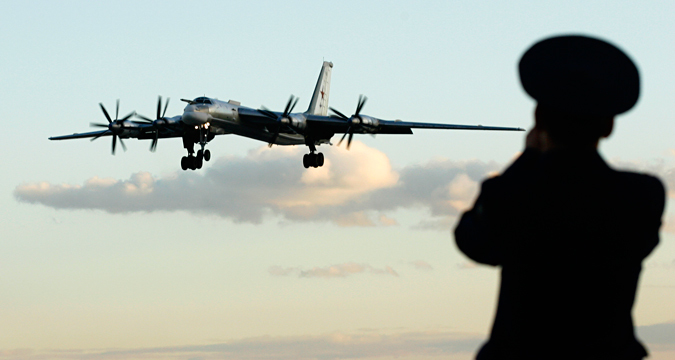 In July 2015, two pairs of Russian Tupolev Tu-95 intercontinental bombers flew along the U.S. West Coast for several hours. The U.S. Air Force scrambled F-22 stealth jets in response to monitor these beautiful aircraft. The presence of the Russian bombers – capable of carrying nuclear weapons although it’s unlikely they were armed – is an ominous sign during the heightened tensions between Russia and the U.S.
American F-22 stealth fighters scrambled about 10 times in 2015 — twice as often as in 2013 — to monitor and photograph Russian Tu-95 Bear bombers and MiG-31 fighter jets that flew over the Bering Sea, the Los Angeles Times reports. Aircraft come and go, but it’s the powerful new Russian submarines steaming into the Pacific that are setting off the alarm bells in the Pentagon. Admiral Viktor Chirkov, the head of the Russian navy, recently said Russian submarine patrols had increased 50 per cent from 2013. In September 2015 Russia despatched the ‘Alexander Nevsky’, its deadliest nuclear submarine to the Pacific theatre. The Borei-class SSBN has 16 Bulava intercontinental ballistic missiles aboard. Each missile is armed with six to 10 nuclear warheads, which means in theory each sub can take out up to 160 enemy cities as far as 8300 km away. That’s a lot of firepower for one submarine. The arrival of the Boreis marks the first significant upgrade of the Russian Pacific Fleet SSBN force in more than three decades. In a fascinating report, War is Boring, quotes an expert, noting that Russia is the only country on the planet with the ability to build a nuclear submarine quiet enough to evade U.S. detection. A March 2015 story in The Diplomat describes the ‘Alexander Nevsky’ as “Putin's Red October” while Russia Today calls the new SSBN-class sub “the planet’s most advanced nuclear deterrent tool”. Several Borei SSBNs are expected to follow over the next few years to replace the older – and still potent – Delta-III SSBNs currently operating in the Pacific. As well as the nearly 580 feet Borei SSBNs, the Russian Navy plans to order six improved Kilo class diesel-electric submarines for the Pacific Fleet, says a Janes report. The arrival of these relatively smaller yet super quiet undersea vessels will certainly complicate the U.S. Navy’s operations in the Pacific. The combined air-sea Russian pincer doesn’t necessarily pose a threat to the U.S. Navy in the Pacific. The Pacific is a vast theatre and Moscow is certainly entitled to equip its forces with the weapons needed for defence and deterrence. But because strategic bomber flights and submarine patrols are expensive to conduct regularly, there is more than one reason why Moscow is pressing ahead with them. First up, these patrols are an excellent way to test U.S. defences. U.S. as well as allied air and naval defence networks will light up like a Christmas tree each time Russian bombers and naval assets pass close to them. Russian intelligence gathering systems such as aircraft, ships and spy satellites can scoop up the rich data during such occasions. Two, Russia is projecting its newly assertive global power. In April 2015, Admiral Bill Gortney, the head of NORAD, told reporters that Russia was using its long-range bomber fleet to "message" the U.S. about Moscow's international military capabilities. "They are messaging us. They are messaging us that they are a global power," Gortney said, noting that the U.S. did "the same sort of thing" to Russia in Europe. Thirdly, by increasing the heat in the Pacific and forcing the U.S. to divert more resources and attention to this region, Russia can get the U.S. off its back in Ukraine and Syria. According to General Herbert Carlisle of the U.S. Air Force, “it’s a combination of things”. He links the uptick in Russian traffic to the situation in Ukraine. “We relate a lot of that to what's going on in the Ukraine," he says. Plus, he believes Russia is demonstrating its capabilities and gathering intelligence on US military exercises. Carlisle was spot on. As tensions heightened over Ukraine, Russia’s Defence Minister Sergei Shoigu said in a statement in November that Russia's strategic bombers would resume patrols in both the Atlantic and the Pacific. "In the current situation we have to maintain military presence in the western Atlantic and eastern Pacific, as well as the Caribbean and the Gulf of Mexico," he said. The Pacific surge is much less than they were doing in the Cold War when Moscow had over 800 naval vessels in the region. Commenting on Russian military activity in the Bering Sea area, Dmitry Gorenburg, a research analyst at the Center for Naval Analyses in Washington said: "I don't think they're threatening anyone. They just want to make sure that no one comes into the Arctic and messes with them." The increase in Russian naval activity comes as the U.S. also faces a rapidly expanding Chinese navy. Over the past two years, China has built five artificial islands in the South China Sea to boost its power projection in the Pacific. Chinese warships and maritime attack aircraft are undertaking patrols in the Asia-Pacific in response to US air and naval movements in the region. As Beijing and Moscow grow increasingly closer, the possibility they could work in tandem could prove to be a bigger headache for Washington than either Russia or China acting alone.